Marketers have always found a way to promote. From the early days with posters and classifieds to the modern days with emails, TV Ads, and SMS, there has always been a way to reach out to target customers. Push notifications are one such marketing tool that have gained immense popularity because of their unique and smooth reachability. With a mammoth scope, some marketers are even seeing it as a replacement for SMS and email marketing. Especially in the eCommerce domain where there is no limit to the competition a new startup has to face, push notifications are being seen as a boon to marketers. But, can push notifications ever replace traditional marketing channels? This article aims to explain the unique benefits of Browser Push Notifications which are common these days. We will compare this tool with its alternative and see if it’s competent enough to face the heat of intensive competition of other eCommerce marketing tactics. Push notifications, in general, are the clickable messages popping up on a device screen, triggered through a mobile app or a web server. Depending on the OS, these pop-ups are shown as different banners on your device. You don’t need a recipient’s contact number or email address to send a push notification. If a push notification is triggered by a website through a web server on a web browser, we call it a web push notification or browser push notification. It differs from an App push notification because you need not install a mobile app to receive these notifications. You can receive them on any device that has a web browser installed. For example, chrome push notifications from Google’s Firebase cloud messaging service. How do browser push notifications work? Browser notifications work through a combination of two technologies- “Push” and “Notifications” and are assembled using two separate APIs for “Push” and “Notification” services. The Push API sends the notifications through a web server to a web service provider. The Notification API displays the triggered information in the notification to the users. 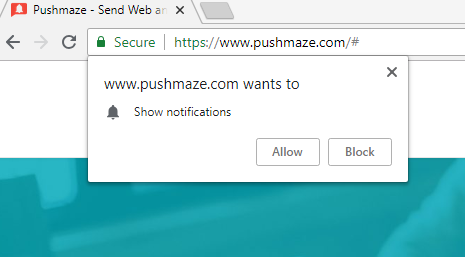 To send a notification on a device with a web browser, the website must ask for the users’ permission through an opt-in box with two options- “Allow” or “Block”. The web app cannot deliver a notification if users click on the “Block” option. If they click on the “Allow” option, the web server gets the permission, and can trigger all sorts of browser push alerts to that user. What are the conditions and constraints of browser push alerts? You cannot send a browser push message without requesting a user’s permission in the form of opt-in box choices. You can trigger browser push alerts on both mobile and computer web browsers. You cannot trigger web push notifications in web browsers with active Incognito Mode. You cannot send browser push alerts to Chrome users on iOS or Mac devices. You cannot deliver web push messages to users who have opted-out through their browser settings. What do you need to generate sales using any marketing tool? People who can be integrated into a communication channel. Interested people to stay subscribed and engaged. Push notifications are the best bet in this regard. Various Studies have been conducted to determine the effect of push notifications and found that push alerts can improve mobile app open-rates by 25% and app retention by 92%. Additionally, with an average open rate of between 30% -60% and engagement rates of up to 40%, push notifications are superior to other marketing channels such as a traditional channel like email with an open rate of just 20% and an average click-through of 5.4%. The engagement stats for push are far better than any other marketing channel. With an improved engagement rate, the benefits of push notifications via web services can further boost the prospect for eCommerce sales generation by at least two-fold. Web pushing gives an instant communication channel to marketers where they can connect to a user without any email data or phone number. Web-based alerts work similarly to app push notifications as they can also be triggered on Android and Apple phone web browsers. You don’t need a mobile app to use web push notifications for eCommerce marketing. There are no spam filters in push marketing. Unlike email, push notifications do not have to go through spam filters. All notifications are delivered to all subscribers. Web pushing supports cross-platform delivery, including mobile, laptop, tablet, computer and even smartwatches. It will deliver your messages to every subscriber on every platform, OS, or Web browser. Why browser push notifications for eCommerce business? SMS and Email have been used for a long time now. In 2019, it’s time to shift from these traditional communication modes to the new trend of web pushing. Users can subscribe to web push notifications more easily than to SMS and Email and saves them from having to share contact numbers and Email addresses. They can simply opt-in from the opt-in pop-up by clicking on the ‘Allow’ button. Since web push alerts do not have to go through spam filters, the message delivery rate is always higher than for SMS or Email. Further, various studies have found that 50 percent of prospects willingly opt-in to push notifications. As a result, 50 percent click-throughs are almost certain. Various push marketing tools provide a central dashboard for creating, sending, and tracking web push campaigns. They also provide built-in user segmentation to categorize different subscribers for different campaigns. As a result, you can micro-personalize your campaigns and make them relevant to your users. Various built-in features in web push marketing tools let you customize campaigns. Strong calls to actions, images, and clickable links always take a user to your landing page with one click. Most marketing emails and SMS, on the other hand, get lost in the Inbox or spam filters. The foremost task is to get users to subscribe to your web push alerts. Set up some strategic pop-up triggers to accomplish this. Don’t just jump in and immediately ask as they land on your website. Setup push notifications to entice new customers at certain touch points only. Re-design the opt-in box and personalize it for your kind of campaigns. Send alerts about new products being sold on your eCommerce store. By promoting new arrivals, you can re-engage idle or inactive customers and encourage them to visit your site to check out fresh product arrivals. Send price drop alerts to customers waiting for a price cut. Since they were already interested, there is a higher chance of them purchasing the product and you won’t have a hard time convincing them or getting a click-through. According to IBM, retailers lose $93 billion of possible annual sales because of unavailable stocks. Don’t let this ruin your sales. Give your customers the option to subscribe to back in stock alerts. Send a well-crafted stock alert once the product is back. There is a high probability that such customers will make a purchase. You can use Google Analytics Enhanced eCommerce reports to learn about such products and customers. With instant message delivery in real-time, web push alerts are handy for announcing deals and attracting instant traffic to eCommerce sales campaigns. You can use them for sending alerts about surprise sales, discount coupons, exclusive deals, and time-sensitive campaigns. The above is just a glimpse of the wonders you can do for your eCommerce marketing campaigns using push alerts. Please note that marketing is not all about directly promoting your products; it is also about engaging your prospects. So, don’t just limit yourself to promotions with push notifications. Use the opportunity to connect with your subscribers and engage them with your brand. Conversions and sales are just the add-ons to better deliverability. If applied carefully, these push strategies can skyrocket your eCommerce marketing like never before. Marry Ann is a branding consultant for PushMaze, a provider that lets you send trackable web Push Notifications for users. She mainly passionate about building brands in all aspect of online marketing.